Learn how Citizens Bank attracts candidates to its career site by promoting employee stories first and open jobs second. This Recruitment Marketing strategy enables Citizens to recruit for “fit” in a highly competitive job market. We all love a good story, and so do candidates. That’s why storytelling has become an important Recruitment Marketing skill for everyone in HR and Talent Acquisition. As candidates become aware of your employer brand, think about applying for one of your jobs and consider accepting your offer, they have questions about your company values, culture and career paths. For answers, they want to hear from the source: your employees. 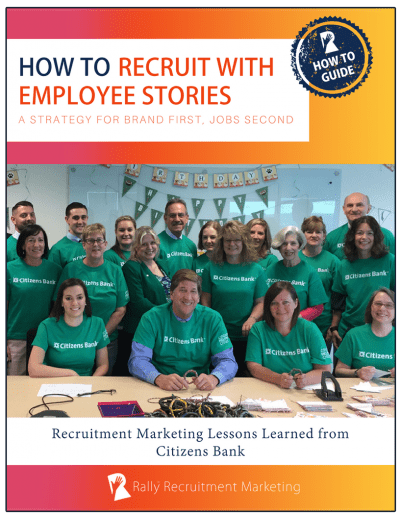 To learn how to make employee stories the center of Recruitment Marketing strategy, Rally turned to the Employer Brand Marketing team at Citizens Bank, the 12th largest retail bank in the U.S. This How To Guide, sponsored by TMP Worldwide, explains how Citizens communicates its employer value proposition and attracts candidates to its career site by focusing on promoting employee stories first and open jobs second. Citizens’ Recruitment Marketing approach enables it to successfully recruit for “fit” in a highly competitive job market. TMP Worldwide is a sponsor of Rally. Their sponsorship fee helps us to provide educational content and events on Recruitment Marketing.